Sometimes having a full sized gas grill just isn’t in the cards, especially if you live in an apartment or condo and have limited outdoor space for your grilling area. Not to worry. There are a bunch of great electric grills & barbecues that perform as well as their gas counterparts, but are designed with space saving in mind. With prices ranging from $40 to well over $700, there’s a model for nearly everyone. I tested about a dozen electric bbq’s and put together my list of the best electric grills for 2018. 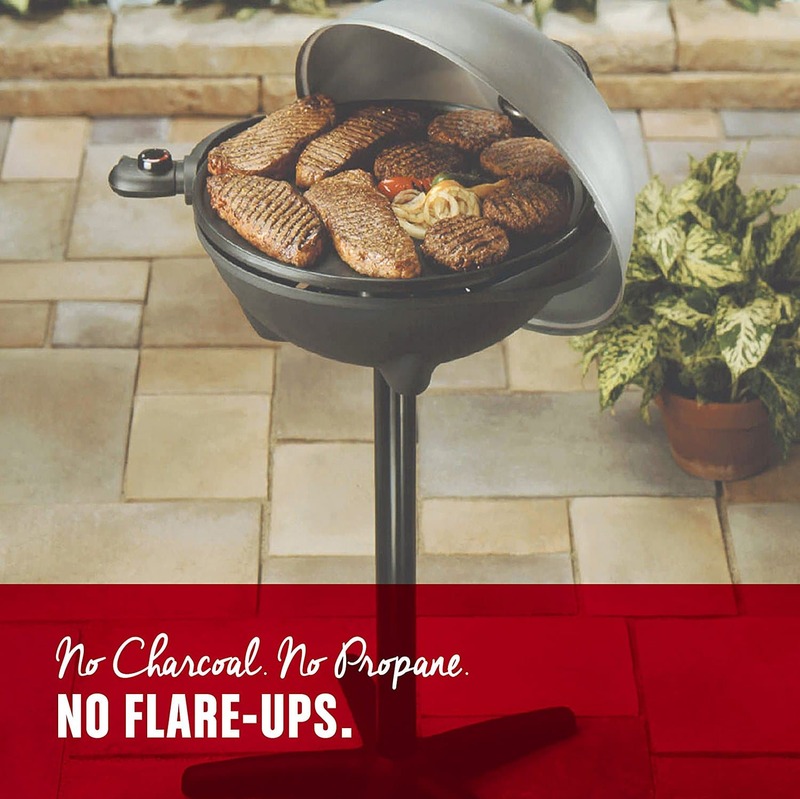 All of these grills perform extremely well, have durable construction and some nice features that you would expect on larger gas or propane grills. Here’s a quick comparison table I put together with the top features from each of the grills that made the “best of” list. I ended up testing about a dozen different electric barbecues with varying features and price points. When all was said and done, the Char Broil Patio Bistro 240 was one of my absolute favorite electric grills and with good reason. This grill is ideal for anyone who has limited space or just isn’t into using gas or charcoal fuels for barbecuing. For most, the switch to an electric grill is just a matter of convenience and this Char Broil unit is the perfect choice for condos and apartments where most grilling is done on a balcony or small patio. This electric grill plugs directly into any 120V wall outlet and is ready to go right out of the box. The TRU-Infrared technology grills burgers and steaks with even heat distribution and I had almost no flare ups, even with the spicy hot links that normally produce an inferno in my gas grill. The porcelain coated grates didn’t stick to any meat or veggies and they wipe clean with ease. As per it’s name, the Patio Bistro 240 has 240 square inches of primary cooking space, which is plenty of room for several hamburgers plus a couple of medium size steaks or chicken breasts. 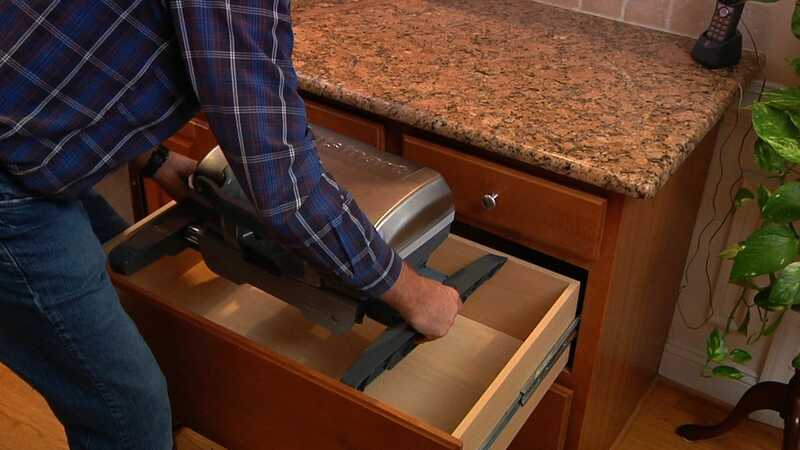 The upper grilling rack is on the small size, but it’s perfectly fine for getting some burgers or hot dogs off the main grill to make room for larger items. The single oven style control knob is straight forward and easy to use. The folding side shelves have some nice space for prep and they fold down which is a nice space saver. 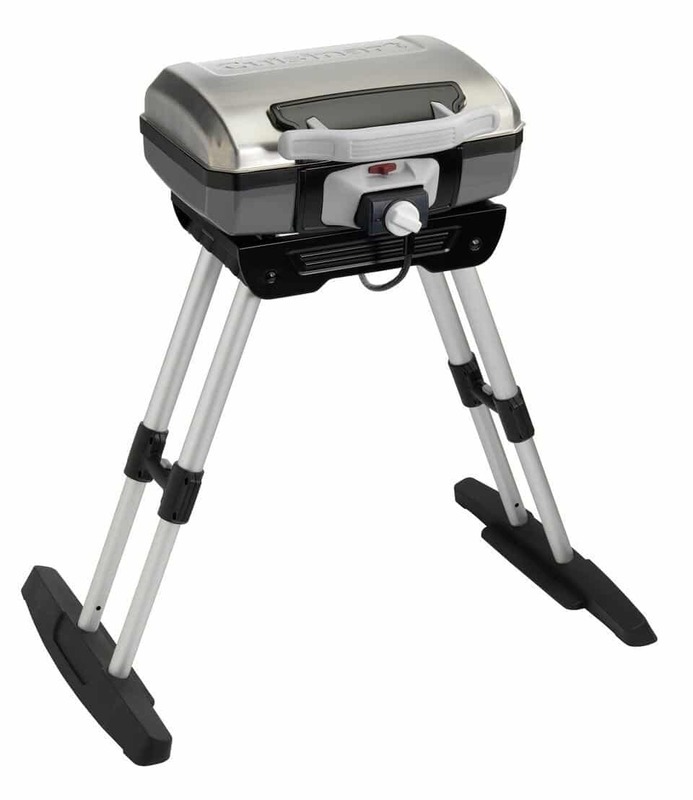 At 54 pounds, the 240 is about on par with most other electric barbecues of this size and it is very easy to move around with the mobile base. I found the lid mounted thermometer to be fairly accurate, but I rarely use the built in temp gauges as my heat indicator. Rather, I use a meat thermometer to get an exact temperature. Overall, this is a solid performer in the electric bbq category. Even though it isn’t loaded with bells & whistles, it cooks well and is built very solid. If you live in an apartment or condo or just don’t have a large outdoor area for grilling, the Char Broil Patio Bistro 240 is right up your alley. Compact and simple to use, but performs nicely and won’t break the bank. The solid construction will keep you grilling on this unit for many years. Well worth putting this electric grill at the top of your list. Next up on my list of best electric grills for 2017 is the Weber Q1400. This unit was restyled a few years ago and the folks at Weber added some cool new styling as well as a larger handle and larger control knobs, which is definitely an improvement over the previous Q140 model. Everyone knows that Weber is an authority on grilling, and even though charcoal and gas grills are their forte, this little electric barbecue is a workhorse that definitely gets the job done properly. The Q1400 is compact and portable, but don’t let that fool you into thinking it’s a wimp when it comes to grilling. The porcelain cast iron grates let you sear burgers and meats with ease. 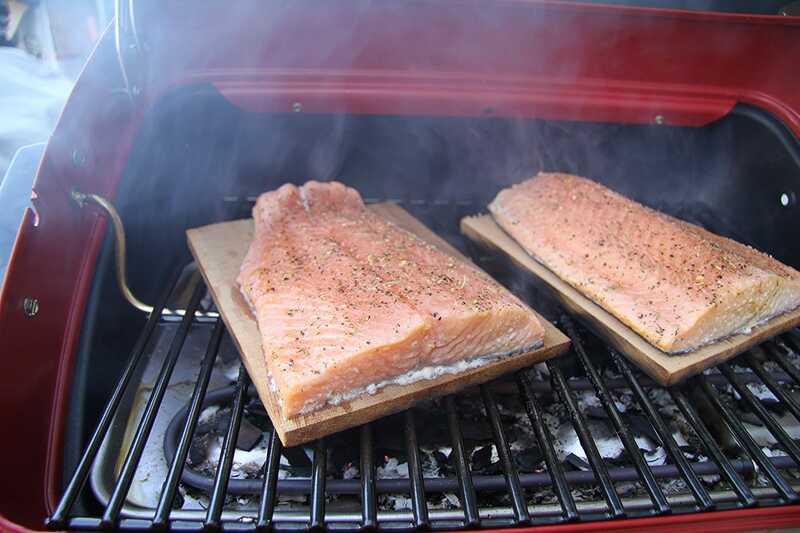 Grilled chicken and fish taste fantastic and cook very evenly with the 1560 watt heating element. 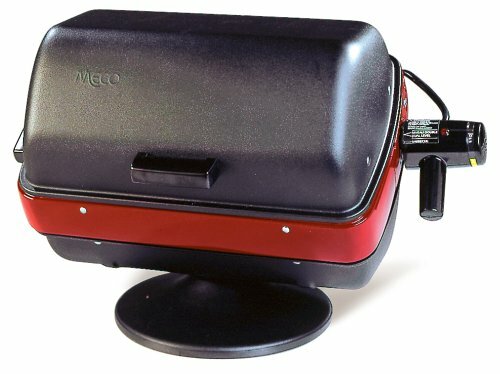 When all is said and done you get the quality of a Weber grill in a compact design that’s perfect for small patio spaces, balconies or even for using on camping trips where you have electrical hook ups. Weber is known for their charcoal and gas grills, but they also know how to make a darn good electric bbq too. The Q1600 is built very well and can put off a good deal of heat. The steaks I cooked on this unit cooked evenly and tasted great. I really like the small, compact size and low weight of this Weber. The price is a little more than some of the other models in this class, but you’re getting Weber quality, which is well worth it in my opinion. Oh the good ol’ George Foreman grill. Despite the goofy TV ads we’ve all come to love, this little grill packs a serious punch for the price(pun intended). What’s great about the George Foreman is that it can be used as an indoor or outdoor electric grill. This is because they separated the heating element and the cooking surface which makes it safe for indoor use. 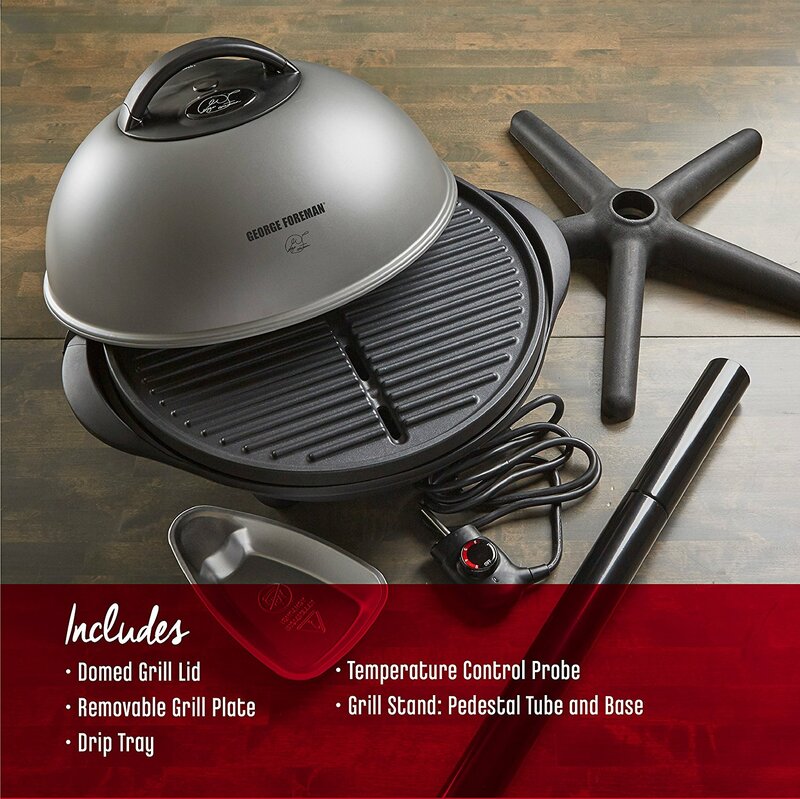 This Foreman doesn’t perform as well as a grill like the Weber I listed at #2, but if you need a small electric grill that can handle burgers, dogs, smaller steaks and chicken, then this might be a perfect option for your home. At only 21 pounds, it’s definitely cooking in the light weight class. You can use it directly on a table top or on the pedestal stand, which is about 2.5 feet tall. Be a little careful when using it on the stand however, because the grill is slightly top heavy an can be knocked over easily. Don’t expect the GF to produce blistering heat. It has a smaller heating element that can take some time to warm up, but it does a decent job once it’s ready to go. The George Foreman 15 electric grill isn’t exactly going to blow your socks off with features and performance. However, it’s small, affordable and gets the job done without any real issues. 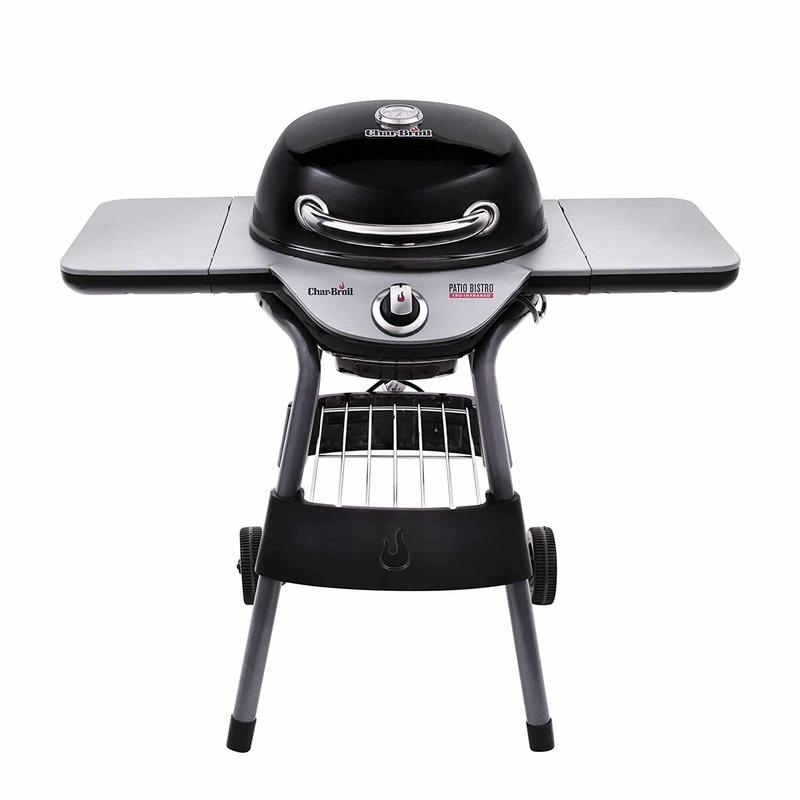 You can set it up indoors or use it on the patio as well, which you can’t say about most other electric grills. If you’re limited on space and need an electric barbecue for occasional grilling, consider picking up a George Foreman grill. The Easy Street Tabletop electric grill comes in several different configurations, but all of them feature a 200 square inch cooking surface and a 1500 watt heating element that does a respectable job of cooking meats and vegetables alike. 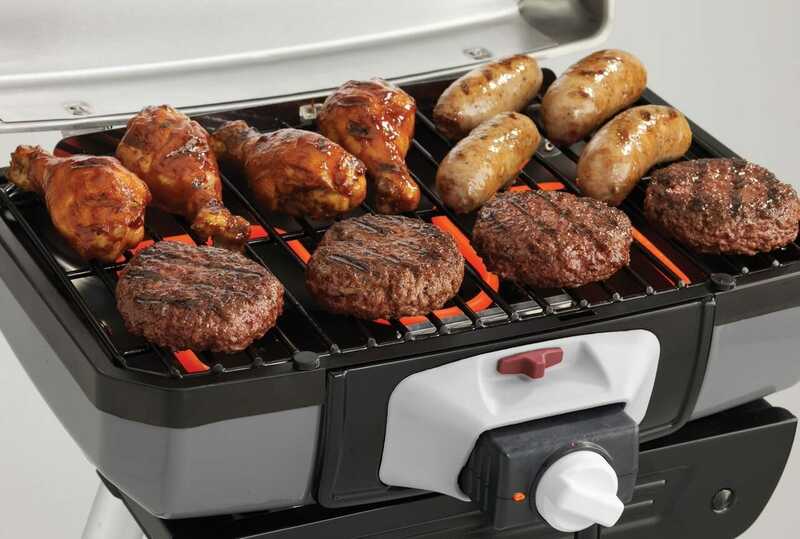 The Easy Street grill plugs into any 120v wall outlet and assembles quickly so it’s ready start grilling in no time. The components are high quality, powder coated steel for corrosion resistance. You can actually fit the entire unit into most dishwashers for quick clean up. How many grills can claim that? The Easy Street electric grill is a pretty solid little unit. I actually like it better than the George Foreman grill, but I ranked it #4 because of the price. I think it could be a little cheaper for what you get, but overall it’s built well and gets the job done. It only weighs 23 pounds, so it’s very mobile and takes up very little space, despite having 200 sq/inches of cooking space. Don’t expect to be grilling racks of ribs or anything huge, but it will grill the standard stuff pretty well. My final portable electric grill pick is the Cuisinart CEG-980. This grill performed extremely well and being a big fan of Cuisinart products to begin with, this electric bbq didn’t disappoint. 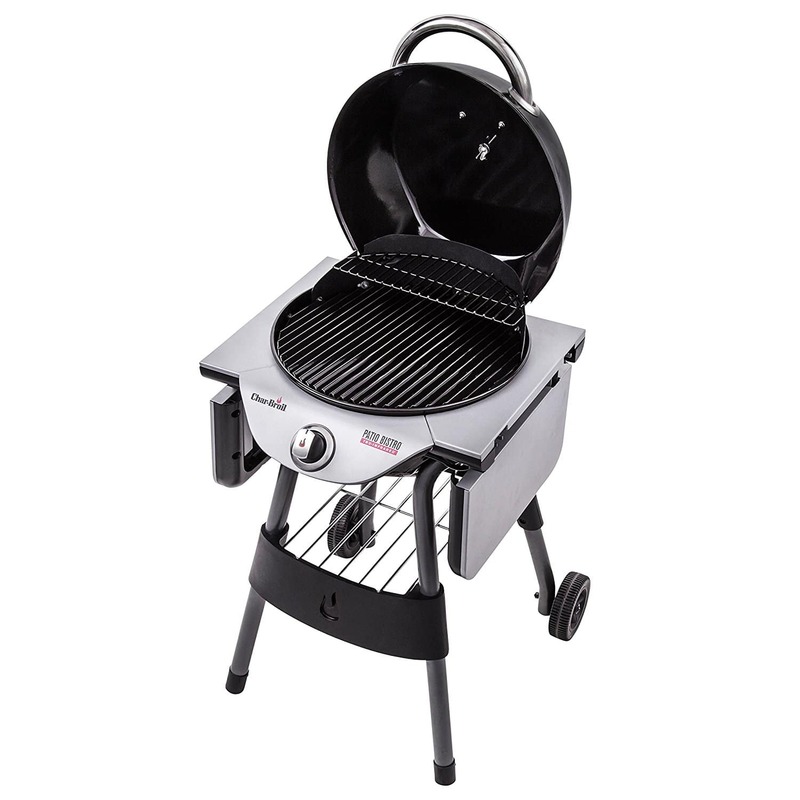 It has a 1500 watt, 5120 BTU burner which puts out the most heat of all the grills on this list. It has 145 sq/inches of cooking space, which isn’t huge, but you can fit up to 8 burgers or 8 steaks at a time, which is great. This unit has a single control knob, which regulates the temperature extremely well. The CEG-980 weighs a paltry 16 pounds, so almost anyone can move this grill around with ease. You can purchase as the table top model or with the telescoping stand (which is very sturdy). There’s absolutely no reason you couldn’t throw this grill in the trunk of your car and take it to the beach, camping or a park as long as you have access to a 120v power supply. 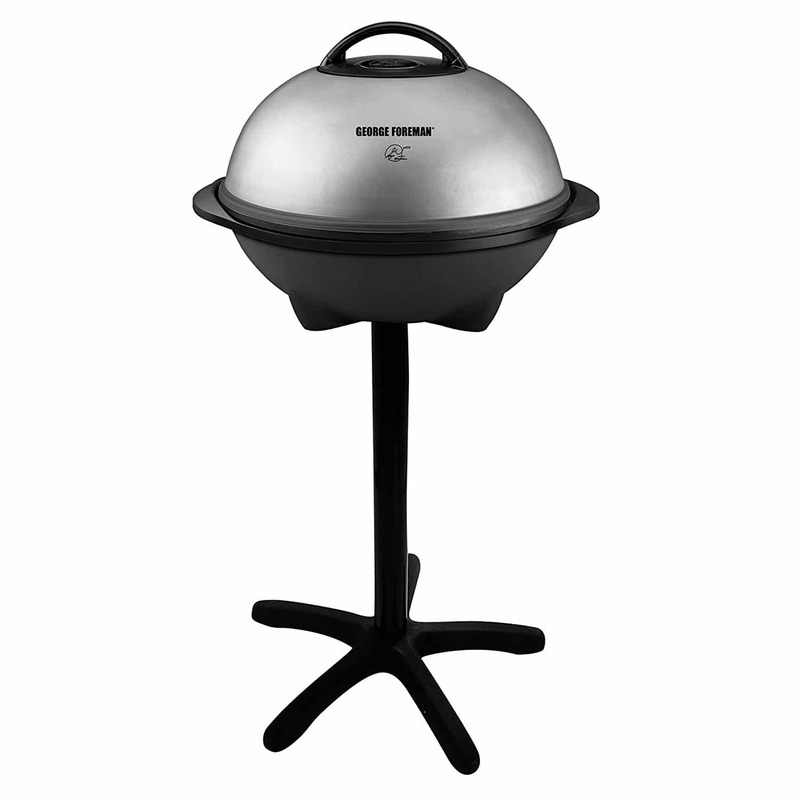 This is a great little portable electric bbq that is perfect for small patios and balconies. 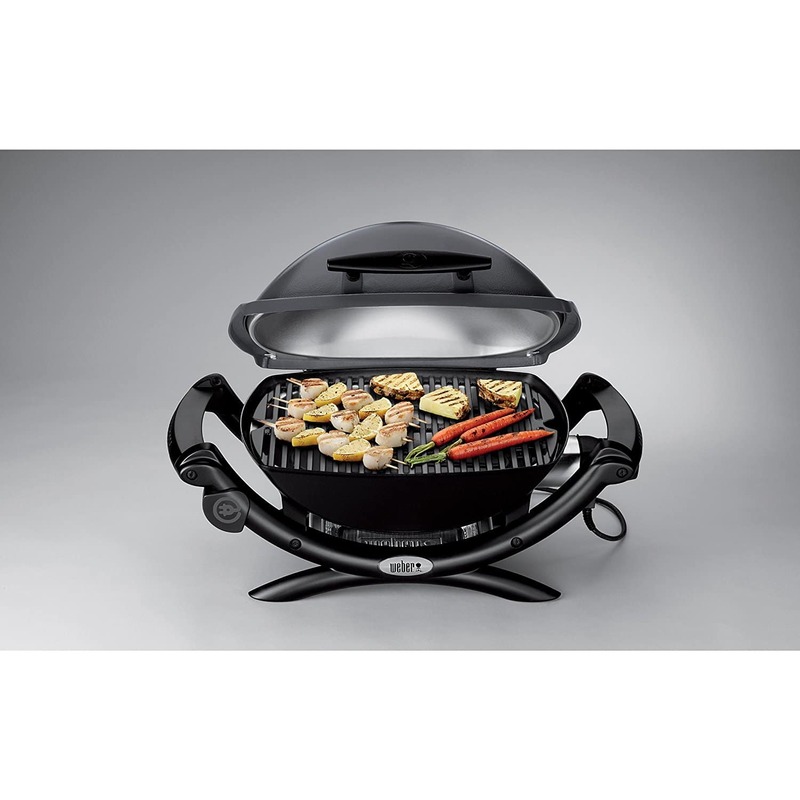 The Cuisinart CEG-980 is a great choice for a compact, lightweight and affordable electric grill. Good heat output cooks all foods well. Durable construction means this unit should last for several years. The available telescoping stand is great for using on a small balcony or patio. Super easy to use. No set up or assembly. Excellent value for the price. 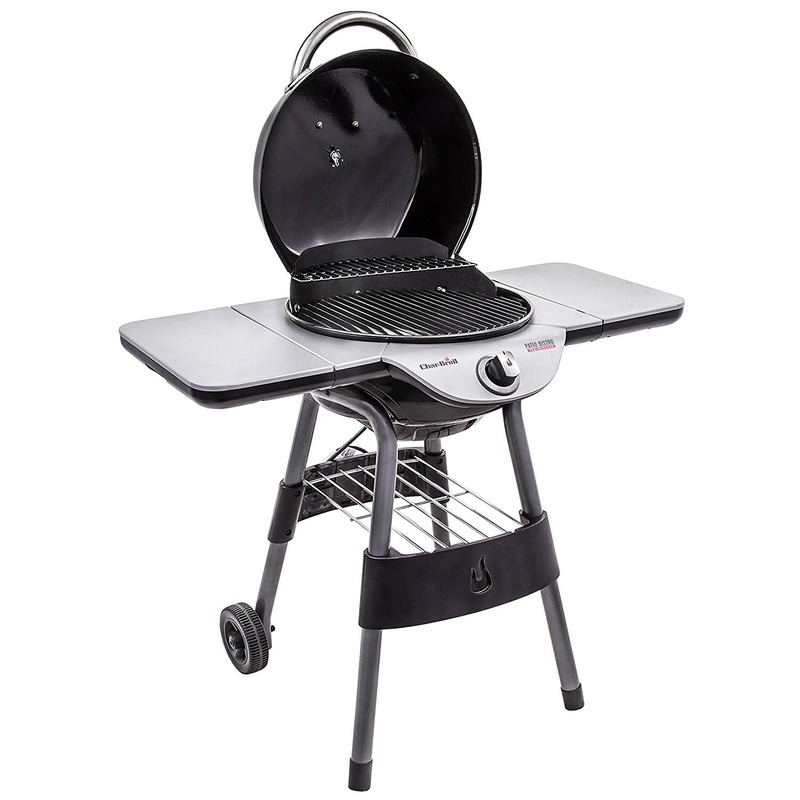 By now you’ve probably figured out that most of these electric barbeque grills are meant to be space savers. They obviously don’t feature the power of a big gas or propane grill, but if you don’t have a large area for grilling you really can’t go wrong with an affordable electric bbq like the one’s I’ve reviewed here. 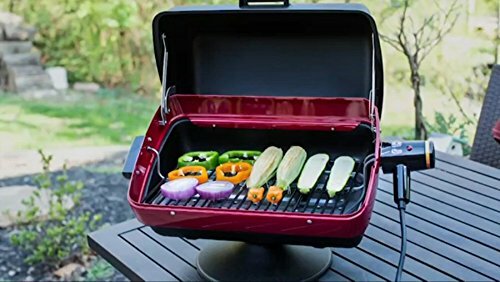 To make your life easier, I’ve put together a short electric grill buyers guide to help you know what you should be looking for when purchasing one of these smaller, portable electric grills. The main consideration for most when buying an electric grill is size. It’s likely you’ll be grilling on a balcony or small area, but try to get the biggest electric grill that will still work for your space. This will give you more grilling surface area, so you can cook more food in one shot. 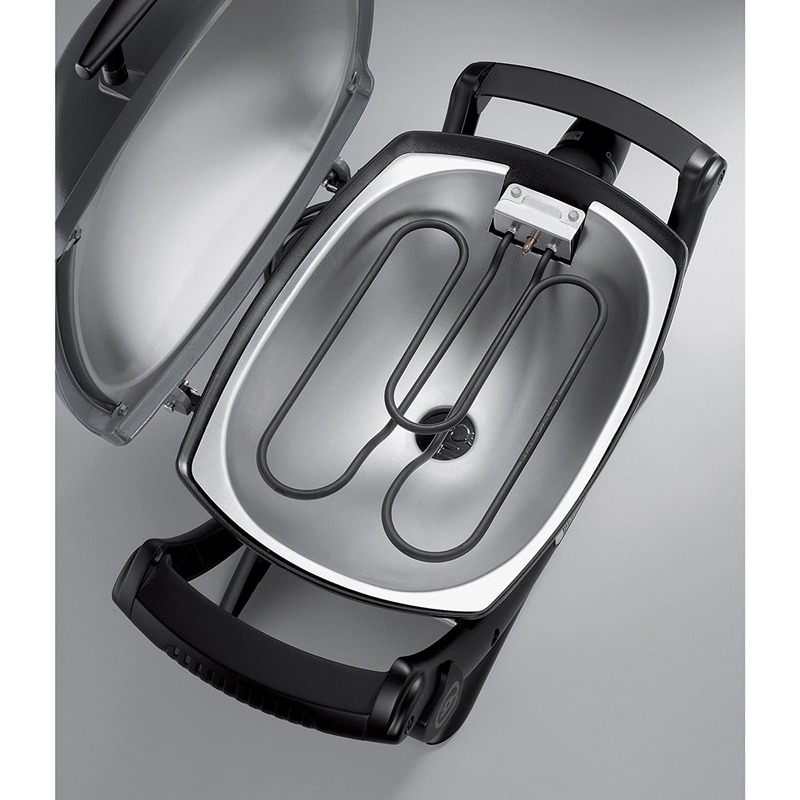 The best electric grills that have lids will also come with a built in temperature gauge. This will let you know the unit is ready for cooking. Grills without lids will normally have an indicator light that tells you when the grill is up to temperature. You’re not going to find an electric grill with 45,000 BTU’s, but make sure you get one with enough power to keep the unit hot after you open the lid. You want the grill to recover heat fast so you keep the food cooking at a consistent temperature. Almost all small, electric grills will have removable grates that you can wash. Try to get a model that has porcelain coated grates, which not only keeps food from sticking, but it makes clean up much easier too. For the most cooking flexibility, get a grill that has an adjustable thermostat. This will allow you to have maximum control over the heat output and adjust it for the type of food you’re cooking. If you plan on investing in a stand for your electric grill or other accessories like a mobile base, always purchase items designed specifically for your model, by the manufacturer. This will ensure you get the proper fit and function from the accessories. 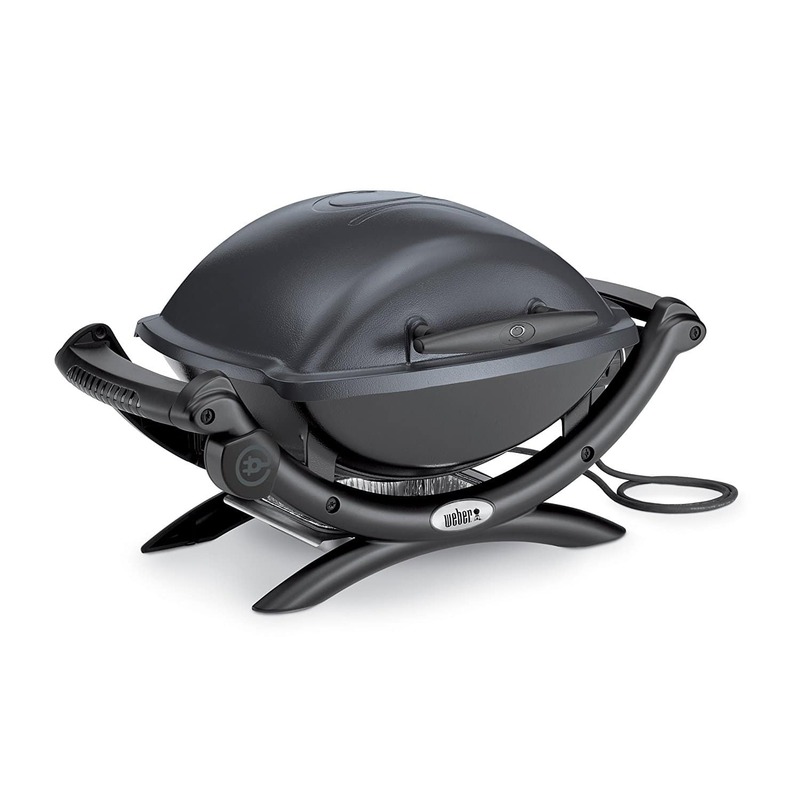 We REALLY like the George Foreman Indoor/Outdoor grill. Super easy to use, easy to clean, and no messing around with charcoal. Highly recommend!